You step into a doctor’s office and he asks you to remove your pants. You don’t bat an eye before standing up and unbuckling your belt. You are in talks with a lawyer and she recommends a strategy that doesn’t seem intuitive but insists is the right move. You readily go along with the plan. You are about to file your tax return and your accountant says you can save $10,000 if you’re willing to try an “unorthodox” manoeuvre. You’ve signed on the dotted line before the words are out of his mouth. Why are we so willing to go along with the instructions of people who are essentially strangers to us? Because they own the seat of power. Even if you don’t yet fully understand the concept, I want you to understand just one thing: the importance of owning the seat of power cannot be overstated and I’m about to show you can use SEO to obtain it for your recruiting firm. Already understand the value of SEO and the seat of power? That’s great news! It’s now time to implement what you know. Download our SEO case study to get started. Who owns the seat of power and why does it matter? The owner of the seat of power is a metaphor for the person who controls an interaction. In most recruiter-client interactions, the client owns the seat of power because the recruiter is perceived as a vendor. The recruiter cold-called the client pitching a service. The client had a plethora of recruiters to choose from and controlled the negotiations. The recruiter may have even agreed to 100% of the client’s terms. In short, the vendor offers a transactional service because he relinquished the seat of power. What is the alternative to being a vendor? A recruiter can be the client’s partner. Instead of being someone who simply offers a service, a recruiter should strive to be the person who is consulted on tough hiring decisions. In practice, this will look much different from a relationship with a vendor. A partner is someone who charges for all of their time (think retained search), is selective in who they work with and can get a client to sign their agreement instead of signing the client’s agreement. So you’re probably thinking – easier said than done! 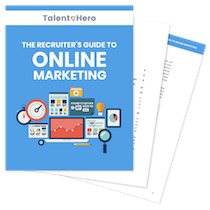 Recruiting is a competitive space and it’s not always possible to get a client to operate on your terms. And that is where SEO comes in. When you cold call a potential client, you are finding them. The perception is that you want to do business with them. Therefore, the client is going to have the upper hand in any negotiation. When a client discovers your business through Google, they are finding you. The perception is that they want to do business with you. Therefore, you are going to have the upper hand in any negotiation. This seemingly small paradigm shift can completely change the way you play the game and allow you to gain the seat of power. And it’s worth thinking a bit more about how this works. The assumption underpinning the idea that being discovered through a search places you in the seat of power is that Google is a trusted recommendation source. And if you think about it, they are. People are so accustomed to using Google to find critically important pieces of information in their lives that they don’t think too much about how the results are generated. When you show up near the top of a Google search (or even better, the top of Google searches for many related keywords), there is an implicit assumption made on the part of the searcher that you are one of the best. 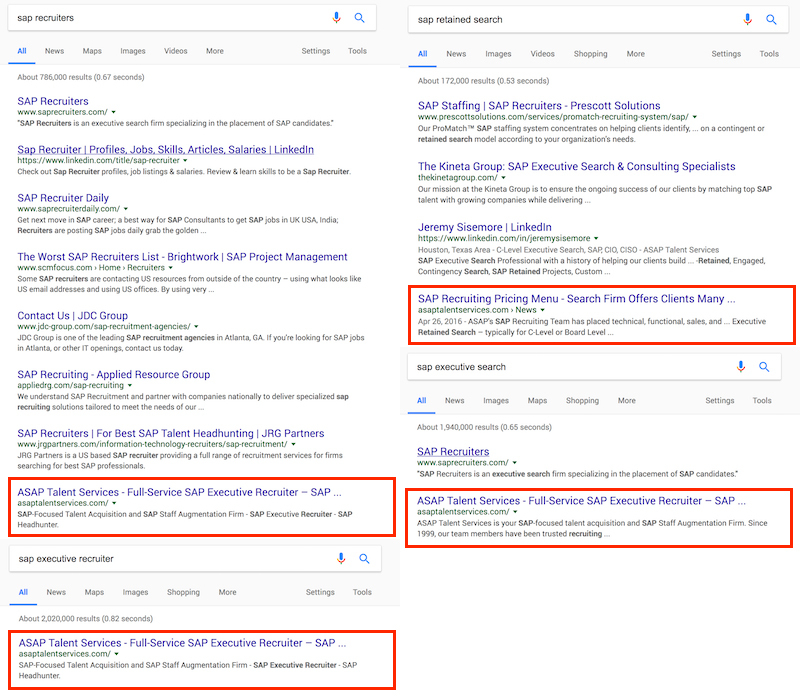 Guess who owns the seat of power in the SAP recruiting market? Now is this assumption true? Not necessarily. For example, we showed you in a previous post how to optimize the on-page SEO of your site to improve your search rankings. Of course, this optimization process says nothing about your competency as a recruiter. But it doesn’t matter! All that matters is that people trust Google and they will therefore trust you. Let’s say that you’re still not convinced and want to leave up the three-page website you built in 2008. There’s another reason to think twice about doing that. Even if you stick to cold calling and think you can obtain the seat of power through other means, you will likely hit a roadblock when potential clients check on you to find out if you are who you say you are. For example, if you say you’re an expert in retail hiring, are the jobs on your site retail jobs or a bunch of general jobs? Does your social media presence convey an authority in the retail industry? When they cross-check you by searching “retail recruiter [city name]”, where do you rank? Unless you have an established client base and a solid stream of ironclad referrals coming in, you cannot ignore SEO and your overall web presence if you want to maintain the seat of power.